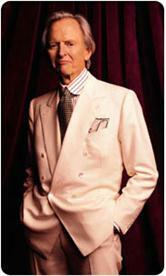 Tom Wolfe grew up in Richmond, Virginia, and graduated from Washington and Lee University. He received his doctorate in American Studies from Yale University. Mr Wolfe worked as a reporter for the Springfield Union (Massachusetts), The Washington Post, and the New York Herald Tribune. His writing has also appeared in New York magazine, Esquire, and Harper's. He is the author of several works of non-fiction: The Kandy-Kolored Tangerine-Flake Streamline Baby, The Pump House Gang, The Electric Kool-Aid Acid Text, Radical Chic and Mau-Mauing the Flak Catchers, The Painted Word, Mauve Gloves and Madmen, Clutter and Vine, The Right Stuff, From Bauhaus to Our House and The Purple Decades, A Reader. His first novel, The Bonfire of the Vanities, was published in 1987. He lives in New York City. Tom Wolfe is the author of more than a dozen books, among them The Electric Kool-Aid Acid Test, The Right Stuff, The Bonfire of the Vanities, A Man in Full, and I Am Charlotte Simmons. A native of Richmond, Virginia, he earned his B.A. at Washington and Lee University and a Ph.D. in American studies at Yale. He lived in New York City until his death in May, 2018.